An Insane Watch for an Insane Price from a brand you probably don’t know about. Watchmaker Antoine Preziuso first debuted this luxury watch in 2015 with an intriguing, grand name; the Antoine Preziuso Tourbillon of Tourbillons timepiece. The main feature of the artisan-made luxury mechanical watch was to present three spinning tourbillons on the dial itself, which also spun like a tourbillon. The animations embedded onto the dial was greatly appreciated by elites of complicated mechanical watch collectors, despite its the “exclusive” asking price of $300,000 plus. In 2016, Antoine Preziuso introduced version with a more accurate movement and a simplified case in the Chronometer Tourbillon of Tourbillons. 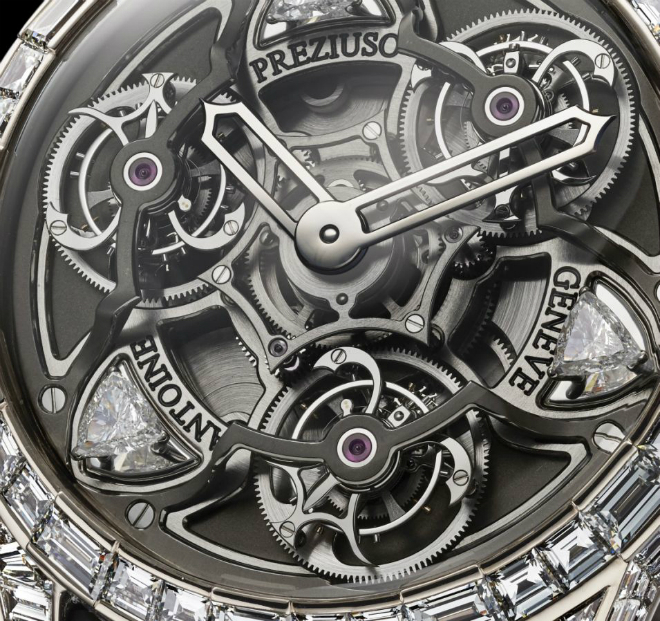 This 2018 receives a new collaboration between Preziuso and his son Florian, as the new Antoine Preziuso Trillion Tourbillon of Tourbillons is made more stunning with intricate diamonds. The timepiece has won both the Innovation Watch Prize and the Public Prize at the Grand Prix d’Horlogerie de Genève, as well as the backing of three international patents for its movement. The case, in 18kt white gold, measures 47mm x 14mm. Elegantly set with Wesselton diamonds totalling up to 24 carats, the 233 count includes large baguette-cut diamonds and three striking “trillion-cut” triangular diamonds on the dial. To keep this artistic structure together, the bezel is screwed on to the middle of the watch with eight lateral gold pillars and 24 “Power”screws in titanium. The 18kt white gold crown set with 20 diamond baguettes and one solitaire diamond. While the name might sound foreign to the masses, Antoine Preziuso is regarded as one of the “old guard” master watchmakers who contributed to start of the the modern watch trend back in the 1990s and 2000s. His avant-garde style and disregard for design customs earned his team both praise and controversy over the years. The movement inside of Antoine Preziuso Trillion Tourbillon of Tourbillons is a house-made, Swiss manual-wind Antoine Preziuso caliber AFP-TTR-3X, with a COSC Chronometer rating, the same as its predecessor. The complex movement comprises of 570 parts, embellished with 65 jewels, running at a frequency of 21,600 vph with a power reserve of 48 hours. Six ball bearings, double serial barrels. 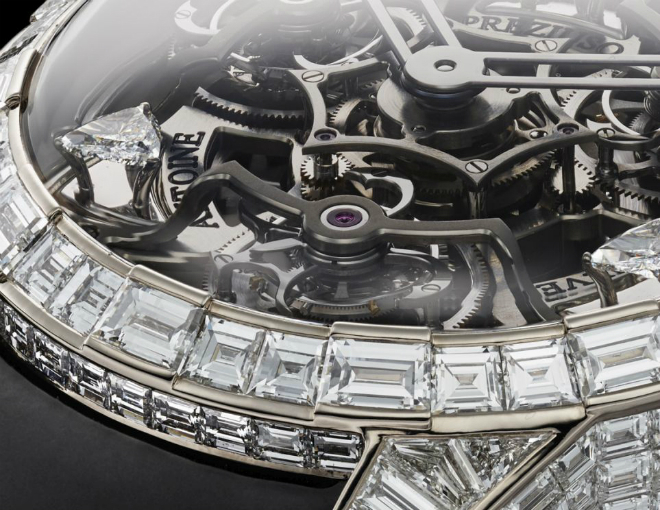 The main feature of the timepiece is the three tourbillons dancing on a revolving plate. 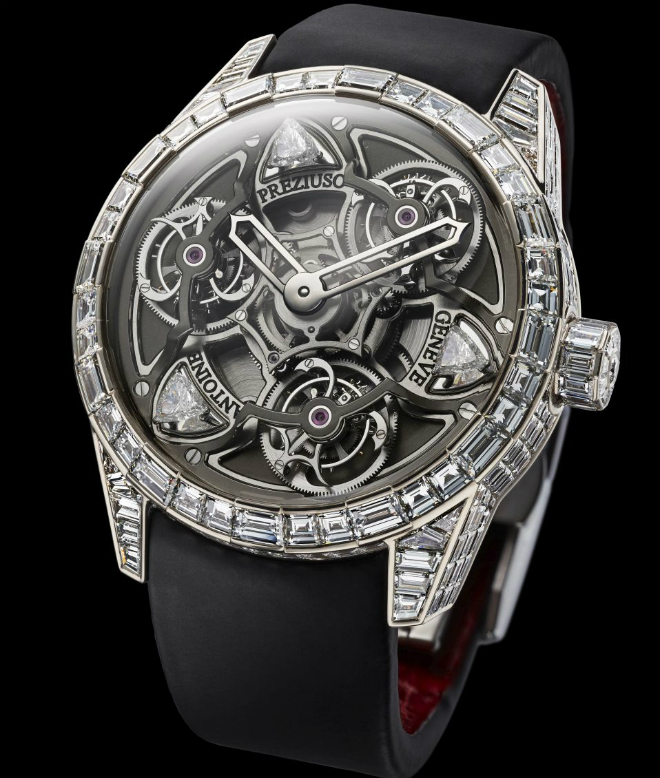 Separated by three pure-white trillion diamonds, the three toubillions are connected by a ‘planetary triple-differential gear’ that increases the accuracy of its mechanical movement. The tourbillons rotate around each other every minute and the plate completes six rotations each hour. The bridges are decorated with Geneva stripes, with three rubies on the sapphire back positioned at six o’clock, opposite from three other smaller rubies at twelve o’clock. The movement back is almost perfectly symmetrical, displaying a polished surface and detailed finishing. 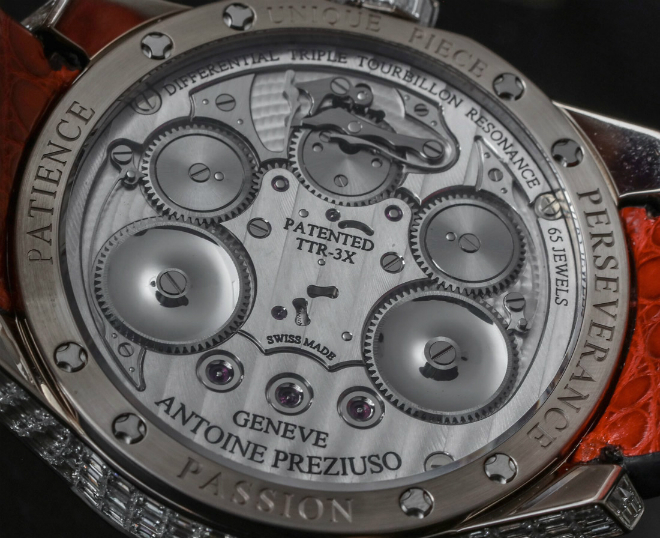 The words “passion, patience, and perseverance” are engraved on the back of the watch. Aptly so for a watch of such incredible fine and ingenious craftsmanship. 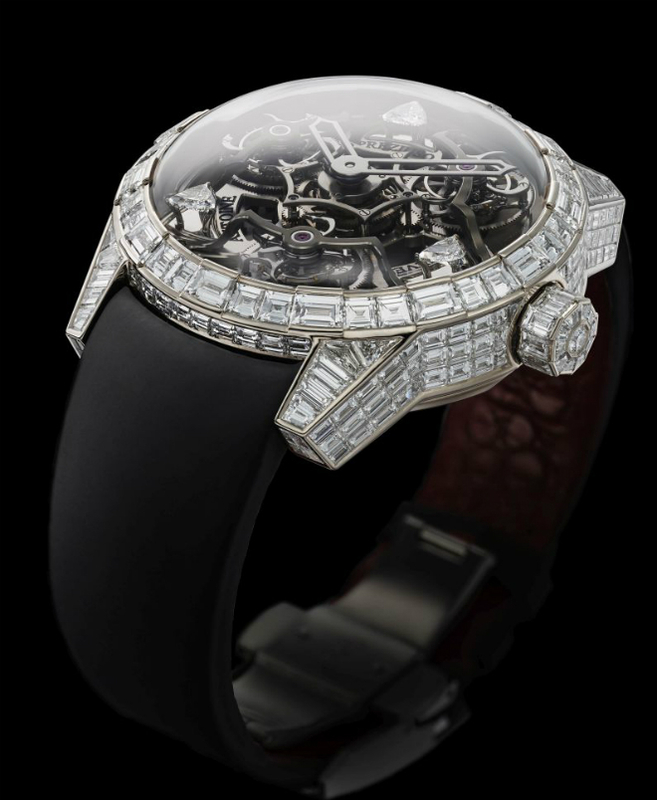 It intricate face is finally set on a black rubber strap with crocodile leather lining, and the Trillion Tourbillon of Tourbillons is complete with an 18kt white gold deployant set with, of course, more diamonds. Is this the World’s Most Expensive Book?